PRINCETON JUNCTION, N.J.—Nov. 14, 2016—While some interns may sit tucked away in lonely offices, Creative Marketing Alliance (CMA)’s public relations and marketing interns got front-row seats to all of the exciting work going on at the award-winning strategic marketing and integrated communications firm. 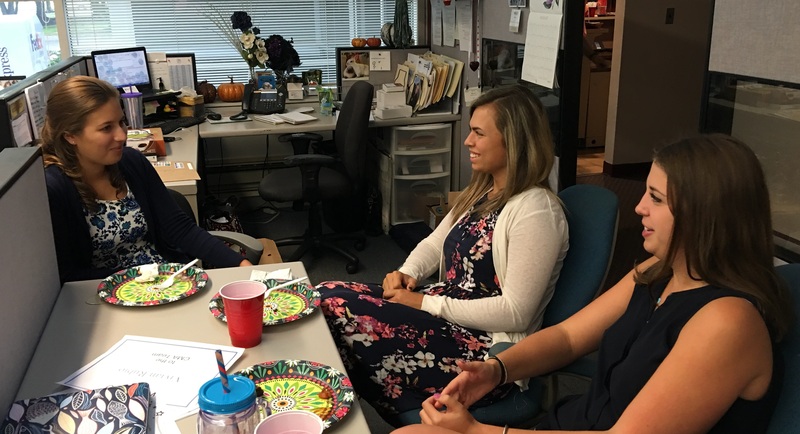 CMA Interns Casey Parrett, Samantha Collar and Jordannah Schreiber share a moment during a CMA luncheon. Samantha Collura, Sydney Matuszewski and Jordannah Schreiber joined the marketing team, while Casey Parrett joined the public relations team. Each of these interns had the opportunity to work directly with members of the CMA staff. 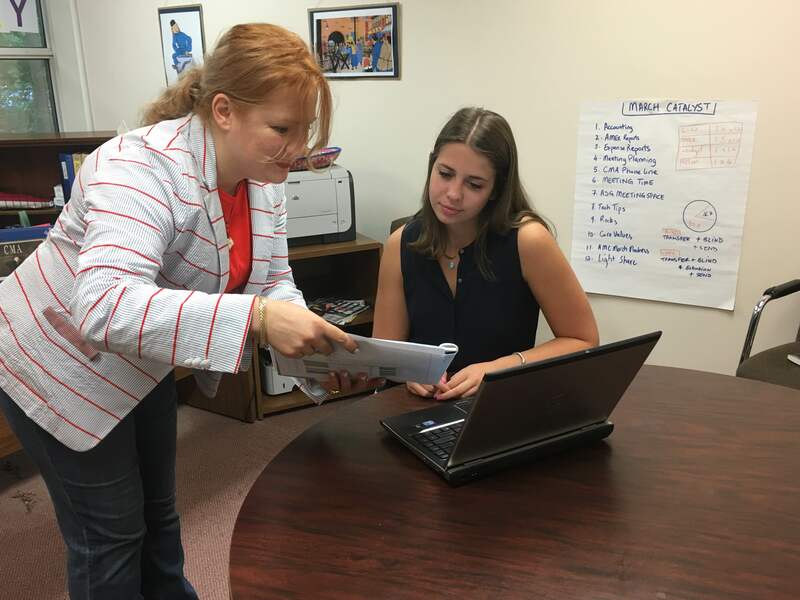 CMA Intern Jordannah Schreiber works with Gabrielle Copperwheat, director of operations on a marketing project. The conference emails each had a short video promoting the event, and Schreiber helped to develop the scripts and creative concepts for each one so there was a cohesive feel to the whole campaign between the emails and the videos. “From the exposure of working with another intern on the in-house marketing team, I was able to get a better understanding of the marketing field, and I really enjoy it because of the creativity and teamwork involved,” said Schreiber, of Lawrenceville, who is studying at Hobart and William Smith College in New York. There are plenty of rewarding marketing projects to go around at CMA. 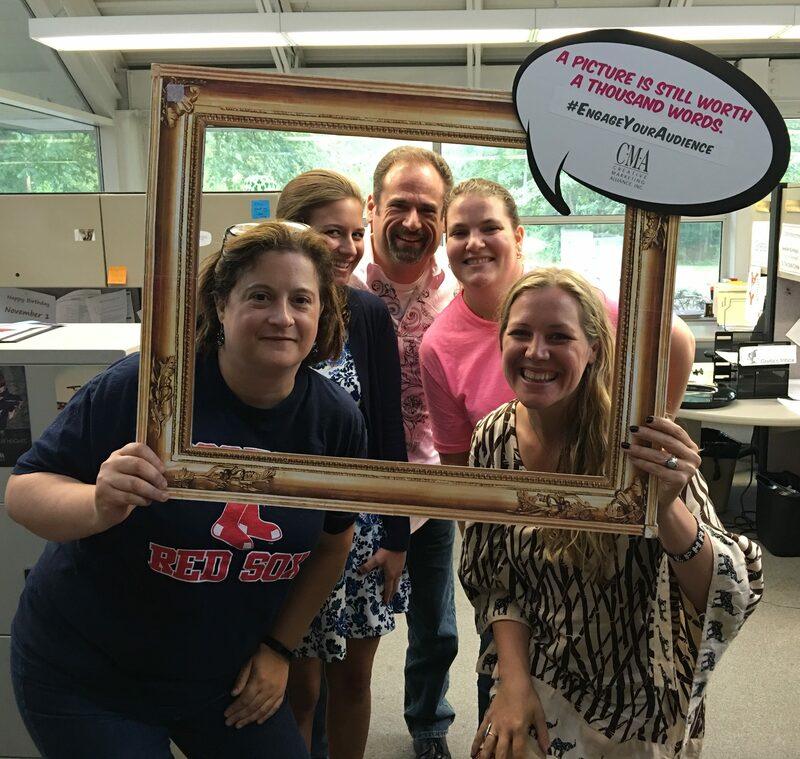 The CMA PR team shares a funny moment with Casey Parrett, who worked with the team throughout her internship at CMA. “I completed demographic and psychographic research for a client trying to break into a niche market, helped review and check websites for errors and worked on search engine optimization (SEO) for different headlines and blogs,” said Matuszewski, who is majoring in pharmaceutical and healthcare marketing and minoring in interdisciplinary health services at St. Joseph’s University in Philadelphia, Pennsylvania. As the only public relations intern this semester, Parrett had many opportunities before her. Learning experiences at CMA don’t end with assignments, but continue under close observation of the team. The benefits of an internship with CMA reach far beyond the actual internship. In addition to learning how to be the best in the field, interns also learn how to communicate the value of marketing and public relations to others. CMA is now accepting applications for interns. For more information, click here or email us at info@cmasolutions.com. Creative Marketing Alliance (CMA) is a full-service, award-winning strategic marketing and integrated communications firm that builds reputation, relationships and return on investment. It creates and manages results-driven marketing programs using Marketecture, a strategic analysis that helps clients understand how their company can best be positioned in the marketplace. For 30 years, CMA has provided innovative solutions, which include public relations, social media marketing, publications along with an in-house studio for digital and creative design. If you’re expecting results, please visit CMAresults.com, call 800-852-4269 or email us info@cmasolutions.com.